NEW MS TEST MANAGER TOOL AVAILABLE!! MTM Copy can copy and cloning Test Suites and Tests over Team Projects and Team Collections. Open MTM Copy Tool, specify the Source and Target Team Projects, can be on Different Collections. On the mapping panel select the desire Test Plans, Test Suites and Test Cases you wish to Clone. Create Test Plan on Target Project, or select an existing Test Plan. Click “Start Migration”, and you’re done! Each Test Case that were copy is saved in Completed Items Mapping, this will prevent copy that save Test Case twice to prevent duplication’s. What is a lab environment? This one is set up for automated tests of an ice cream vending service. The software product itself consists of a web service that runs on Internet Information Services (IIS) and a database that runs on a separate machine. The tests drive a web browser on a client machine. The workflow is controlled by a test controller with the help of test agents installed on each test machine. The test controller runs on a separate computer. Now you might ask why you need lab environments, since you could deploy your system and tests to any machines you choose. You can set up automated build-deploy-test workflows. The scripts in the workflow use the lab role names of the machines, such as “Web Client,” so that they are independent of the domain names of the computers. The results of tests can be shown on charts that relate them to requirements. Lab Manager automatically installs test agents on each machine, enabling test data to be collected. Lab Manager manages the test settings of the virtual environment, which define what data to collect. You can view the consoles of the machines through a single viewer, switching easily from one machine to the other. Lab environments manage the allocation of machines to tests for reasons that include preventing two team members from mistakenly assigning the same machine to different tests. Lab environments come in two varieties. A standard lab environment (roughly equivalent to a physical environment in Visual Studio 2010) can be composed of any computers that you have available, such as physical computers or virtual machines running on third-party frameworks. Create fresh test environments within minutes. You can store a complete environment in a library and deploy running copies of it. For example, you could store an environment of three machines containing a web client, a web server, and a database. Whenever you want to test a system in that configuration, you deploy and run a new instance of it. Take snapshots of the states of the machines. For example whenever you start a test, you can revert to a snapshot that you took when everything was freshly installed. Also, when you find a bug, you can take a snapshot of the environment for later investigation. Pause and resume all the virtual machines in the environment at the same time. Standard environments are useful for tests that have to run on real hardware, such as some kinds of performance tests. You can also use them if you haven’t installed SCVMM or Hyper-V, as would be the case if, for example, you already use another virtualization framework. But as you can see, we think there are great benefits to using SCVMM environments. Because you can store them in a library, SCVMM environments help to make your tests repeatable; when you run them for the next build, or when a new release is planned after a six-month break, you can be sure that the tests are running under the same conditions. For example, on Fabrikam’s ice cream sales project, the team often wants to deploy and test a new build of the sales system. It has several components that have to be installed on different machines. Of course, the sales system software is a new build each time. But the platform software, such as operating system, database, and web browser don’t change. So at the start of the project, the team creates an environment that has the platform software, but no installation of the ice cream system. In addition, each machine has a test agent. The Fabrikam team stores this environment in the library as a template. Whenever a new build is to be tested, a team member selects the stored platform environment, and chooses Deploy. Lab Manager takes a few minutes to copy and start the environment. Then they only have to install the latest build of the system under test. While an environment is running, its machines execute on one or more virtualization hosts that have been set up by the system administrator. The stored version from which new copies can be deployed is stored on an SCVMM library server. Some teams have already invested in other virtualization frameworks such as VMware or Citrix XenServer. If that is your situation, the case for switching to Hyper-V and SCVMM might be less clear. But even if you don’t install SCVMM or Hyper-V, you can still use Lab Manager by using standard environments. With standard environments, you get many of the benefits of lab management, but without the ability to save and quickly set up fresh environments. Instead, you’d have to use your third-party machine manager to set up new machines. Visual Studio Team Foundation Server, with the Lab Manager feature enabled. A test controller, linked to your team project in Team Foundation Server. (Preferable, but not mandatory) System Center Virtual Machine Manager (SCVMM) and Hyper-V.
You only need to set up these things once for the whole team, so we have put the details in the Appendix. If someone else has kindly set up SCVMM, Lab Manager, and a test controller, just continue on here. More information is available from the MSDN website topic: Getting Started with Lab Management. If your team has been using lab environments for a while, then when you open Lab Center, you might already see some environments that are available to use. Pick an environment with a status of Ready, without an In Use flag, and that looks as if it has the characteristics you want, which ought to be indicated by its name. Select it and choose Connect. The Environment View opens. From here you can log into any of the machines in the environment. Typically, a deployed environment will have a recent build of your system already installed. If you’re sure that it’s free for you to use, you could decide to run some tests on it. However, make sure you know your team’s conventions; for example, if the environment’s name contains the name of a team member, ask if it is ok to use. Log in. Choose the Connect button to open a console view of the environment. From there you can log into any of its machines. More about the Connect button can be found on MSDN in the topic How to: Connect to a Virtual Environment. Reserve the environment. You can mark it as In Useto discourage other team members from interfering with it. This doesn’t prevent access by others, but simply sets a flag in Lab Center. Revert a virtual environment to a clean snapshot. In the environment viewer, look at the Snapshots tab. If the Snapshots tab isn’t available, then this is a standard environment composed of existing machines. You might need to make sure that the latest version of your system is installed. In a virtual environment, the team member who created the environment should have made a snapshot immediately after installing the system under test. Select the snapshot and restore the environment to that state. If there isn’t a snapshot available, that’s (hopefully) because the previous user has already restored it to the clean state. Again, you might need to check the conventions of your team. Explore and test your system. Now you can start testing your system, which is the topic of the next chapter. Restore the snapshot when you’re done with a virtual environment, to restore it to the newly installed state. This makes it easier for other team members to use. This option isn’t available for standard environments, so you might want to clean up any test materials that you have created. Clear the “in use” flag when you’re done.Typically, a team will keep a number of running environments that contain a recent build, and share them. Reusing the environment and restoring it to its initial snapshot is the quickest way of assigning an environment for a test run. If there is no running environment that is suitable for what you want to do, you can look for one in the library. The library contains a selection of stored virtual environments that have previously been created by your colleagues. You can learn more from the topic: Using a Virtual Lab for Your Application Lifecycle, on MSDN. Environments stored in the library are templates; you can’t connect to one because its virtual machines aren’t running. Instead, you must first deploy it. Deploying copies the virtual machines from the library to the virtual machine host, and then starts them. In MTM, in Lab Center, choose Deploy. Choose an environment from the list. They should have names that help you decide which one you want. After you have picked an environment, Lab Center takes a few minutes to copy the virtual machines and to make sure that the test agents (which help deploy software and collect data) are running. Eventually the environment is listed under the Lab tab as Ready (or Running in Visual Studio 2010). Then you’re all set to use it. If it shows up as Not Ready, then try the Repair command. This reinstalls test agents and reconnects them to your test controller. In most cases that fixes it. Typically, stored environments contain installations of the base platform: operating systems, databases, and so on. They don’t usually include an installation of the system under test. Your next step is therefore to install the latest build of your system. To help choose a good recent build, open the build status report in your web browser. The URL is similar to http://contoso-tfs:8080/tfs/web. Click on Builds. You might have to set the date and other filters. The quality and location of each build is summarized. In Lab Center, under the Lab tab, select the running environment and choose Connect. Log into the environment’s machines. Use the installer (typically an .msi file) that is generated by the build process. The location can be obtained from the build status reports. Pick an installer that was generated from the Debug build configuration. You need to put each component on the right machine. Each machine has a role name such as Client, Web Server, or Database, to help you make the right choice. Later we’ll discuss how you can write scripts to automate the deployment of the system under test. Review the name you gave to the environment to make sure it reflects the system and build you installed. Create a snapshot of the environment. This will enable subsequent users to get the environment back to its nice clean state. Do this immediately after you have installed your system, and before you run any tests, other than perhaps a quick smoke test to make sure the installation is OK.
You can create a snapshot either from the Snapshots tab in Environment Viewer, or from the context menu of the environment in the Lab listing. After you’ve taken a snapshot, you can start using it as we described earlier. When you’ve finished testing, you can revert to the snapshot. Delete an environment when the build it uses is superseded. What if there are no environments in the stored library, or none have the mix of machines you need? Then you’ll have to create one. And if you’re feeling generous, you could add it to the library for other team members to use. You can either store an environment directly in the library, or you can create it as a running environment and then store it in the library. Storing directly is preferable if you don’t need to configure the constituent virtual machines in any way. To add a new environment directly to the library, open MTM; choose Lab Center, Library, Environments, and then the New command. In either method, you continue through the wizard to choose virtual machines from the library. If your team has been working for a while, there should be a good stock of virtual machines. Their names should indicate what software is installed on them. Choose library machines that have type Template if they are available. Unlike a plain virtual machine, you can deploy more than one copy of a template. This is because when a template VM is deployed, it gets a new ID so that there are no naming conflicts on your network. Using templates to create a stored environment allows more than one copy of it to be deployed at a time. You have to name each machine uniquely within your new lab environment. Notice that the name of the computer in the environment is not automatically the same as its name in the domain or workgroup. You also have to assign a role name to each machine, such as Desktop Client or Web Server. More than one machine can have the same role name. There is a predefined set to choose from, but you can also invent your own role names. These roles are used to help deploy the correct software to each machine. If you automate the deployment process, you will use these names; if you deploy manually, they will just help you remember which machine you intended for each software component. When you complete the wizard, there will be a few minutes’ wait while VMs are copied. MTM should now show that your environment is in the library, or that it is already deployed as a running environment, depending on what method of creation you chose to begin with. If it’s in the library, you can deploy it as we described before. After creating an environment, you typically deploy software components and then keep the environment in existence until you want to move to a new build. Different team members might use it, or you might keep it to yourself. You can mark an environment as “In Use” to discourage others from interfering with it while your work is in progress. The lab manager library can store both individual virtual machines and complete environments. There are command buttons for creating new environments, storing them in the library, and for deploying environments from the library. You have to shut down an environment before you can store it. You can store individual virtual machines from the test host to the library. Therefore, if your team starts off with a set of virtual machines in the library that include a basic set of platforms—for example, Windows 7 and Windows Server 2008—then you can deploy a machine in an environment, add extra bits, and then store it back in the library. You can create a new machine in the SCVMM console and then install an operating system on it, either with your DVD or from your corporate PXE server. Every test machine needs a copy of the Team Foundation Server Test Agent, which you can get from the Team Foundation Server installation DVD. Use the SCVMM console to store the VM in the library as a template. This is preferable to storing it as a plain VM. In Lab Manager, use the Import command on the Library tab in order to make the SCVMM library items visible in the Lab Center library. A composed environment is made up of virtual machines that are already running. When you compose an environment from running machines, they are assigned to your environment; when you delete the environment, they are returned to the available pool. You can create a composed environment very quickly because there is no copying of virtual machines. We recommend composed environments for quick exploratory tests of a recent build. The team should periodically place new machines in the pool on which a recent build is installed. Team members should remember to delete composed environments when they are no longer using them. In Visual Studio 2012, you make a composed environment the same way you create a virtual environment: by choosing New and then SCVMM environment. In the wizard, you’ll see that the list of available machines includes both VM templates and running pool machines. If you want, you can mix pool machines and freshly created VMs both in the same environment. For example, you might use new VMs for your system under test, and a pool machine for a database of test data, or a fake of an external system. Because the external system doesn’t change, there is no need to keep creating new versions of it. In Visual Studio 2010, use the New Composed Environment command and choose machines from the list. Standard environments are made up of existing computers. They can be either physical or virtual machines, or a mixture. They must be domain-joined. You can create standard environments even if your team hasn’t yet set up SCVMM. For example, if you are already using VMware to run virtual machines and don’t want to switch to Hyper-V and SCVMM, you can use Lab Manager to set up standard environments. You can’t stop, start, or take snapshots of standard environments, but Lab Manager will install test agents on them and you can use them to run a build-deploy-test workflow. You can also use standard environments when it is important to use a real machine—for example, in performance tests. To create a standard environment, click New and then choose Standard Environment. For an example, see Lab Management walkthrough using Visual Studio 11 Developer Preview Virtual Machine on the Visual Studio Lab Management team blog. There’s a lot of pain and overhead in configuring physical boxes to build test environments. The task is made much easier by Visual Studio Lab Manager, particularly if you use virtual environments. Manage the allocation of lab machines, grouping them into lab environments. Configure machines for the collection of test data. Rapidly create fresh virtual environments already set up with a base platform of operating system, database, and so on. 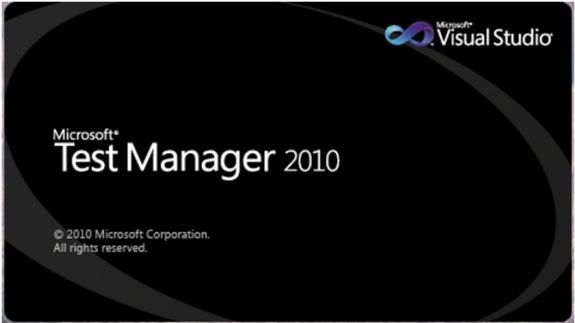 System Center Virtual Machine Manager 2012. Lab Management in Visual Studio 2012 works with SCVMM 2012 in addition to SCVMM 2008. Standard environments. Lab Manager in Visual Studio 2012 is easier to use with third-party virtualization frameworks as well as physical computers. It will install test agents if necessary. Test agents. In Visual Studio 2010, you must install test and lab agents on the machines that you want to use in the lab. In Visual Studio 2012, there is only one type of agent, and it is installed automatically by Lab Manager on each of the machines in a lab environment. You can still install the test agent yourself to save time when lab environments are created. Compatibility. Most combinations of 2010 and 2012 RC products work together. For example, you can create environments on Visual Studio Team Foundation Server 2010 using Microsoft Test Manager 2012 RC. Visual Studio provides a rich extensibility model that developers at Microsoft and in the community have taken advantage of to provide a host of quality add-ins. Some add-ins contribute significant how-did-I-live-without-this functionality, while others just help you automate that small redundant task you constantly find yourself performing. In this article, I introduce you to some of the best Visual Studio add-ins available today that can be downloaded for free. I walk through using each of the add-ins, but because I am covering so many I only have room to introduce you to the basic functionality. Each of these add-ins works with Visual Studio .NET 2003 and most of them already have versions available for Visual Studio 2005. If a Visual Studio 2005 version is not available as of the time of this writing, it should be shortly. Test-driven development is the practice of writing unit tests before you write code, and then writing the code to make those tests pass. By writing tests before you write code, you identify the exact behavior your code should exhibit and, as a bonus, at the end you have 100 percent test coverage, which makes extensive refactoring possible. NUnit gives you the ability to write unit tests using a simple syntax and then execute those tests one by one or altogether against your app. If you are using Visual Studio Team System, you have unit testing functionality built into the Visual Studio IDE. Before the Visual Studio Team System, there was TestDriven.NET, an add-in that integrates NUnit directly into the Visual Studio IDE. Using a non-Team System version of Visual Studio 2005 or Visual Studio .NET 2003, is, in my opinion, still the best solution available. 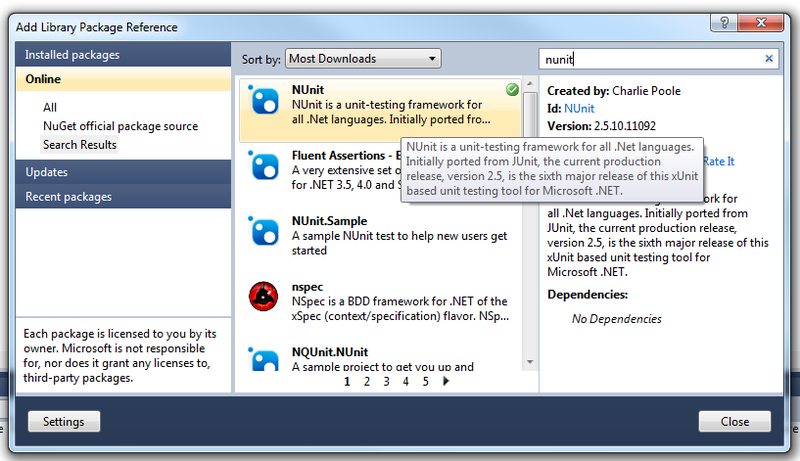 TestDriven.NET adds unit testing functionality directly to the Visual Studio IDE. Instead of writing a unit test, switching over to the NUnit GUI tool, running the test, then switching back to the IDE to code, and so on, you can do it all right in the IDE. After installing TestDriven.NET you will find a number of new menu items on the right-click context menu as shown in Figure 1. You can right-click directly on a unit test and run it. The results will be displayed in the output window as shown in Figure 2. While executing unit tests in the IDE is invaluable by itself, perhaps the best feature is that you can also quickly launch into the debugger by right-clicking on a test and selecting Test With | Debugger. This will launch the debugger and then execute your unit tests, hitting any breakpoints you have set in those tests. In fact, it doesn’t even have to be a unit test for TestDriven.NET to execute it. You could just as easily test any public method that returns void. This means that if you are testing an old app and need to walk through some code, you can write a quick test and execute it right away. TestDriven.NET is an essential add-in if you work with unit tests or practice test-driven development. (If you don’t already, you should seriously consider it.) TestDriven.NET was written by Jamie Cansdale and can be downloaded from http://www.testdriven.net. XML comments are invaluable tools when documenting your application. Using XML comments, you can mark up your code and then, using a tool like nDoc, you can generate help files or MSDN-like Web documentation based on those comments. The only problem with XML documentation is the time it takes to write it you often end up writing similar statements over and over again. The goal of GhostDoc is to automate the tedious parts of writing XML comments by looking at the name of your class or method, as well as any parameters, and making an educated guess as to how the documentation should appear based on recommended naming conventions. This is not a replacement for writing thorough documentation of your business rules and providing examples, but it will automate the mindless part of your documentation generation. Adding these extra comments is much easier since the basic, redundant portion is automatically generated by GhostDoc. GhostDoc also includes options that allow you to modify existing rules and add additional rules that determine what kind of comments should be generated. GhostDoc was written by Roland Weigelt and can be downloaded from http://www.roland-weigelt.de/ghostdoc. Strings play a large role in most applications, whether they are comments being used to describe the behavior of the system, messages being sent to the user, or SQL statements that will be executed. One of the frustrating parts of working with strings is that they never seem to paste correctly into the IDE. When you are pasting comments, the strings might be too long or not aligned correctly, leaving you to spend time inserting line breaks, comment characters, and tabbing. When working with strings that will actually be concatenated, you have to do even more work, usually separating the parts of the string and inserting concatenation symbols or using a string builder. The Smart Paster add-in helps to limit some of this by providing a number of commands on the right-click menu that let you paste a string from the clipboard into Visual Studio using a certain format. After installing Smart Paster, you will see the new paste options available on the right-click menu (see Figure 3). To update a person record, a user must be a member of the customer service group or the manager group. After the person has been updated, a letter needs to be generated to notify the customer of the information change. //To update a person record a user must be a member of the customer //service group or the manager group. After the person has been updated //a letter needs to be generated to notify the customer of the //information change. You do not have the correct permissions to perform <insert action>. You must be a member of the <insert group> to perform this action. Smart Paster is a time-saving add-in that eliminates a lot of the busy work associated with working with strings in Visual Studio. It was written by Alex Papadimoulis. Throughout the process of software development, it is common to reuse small snippets of code. Perhaps you reuse an example of how to get an enum value from a string or a starting point on how to implement a certain pattern in your language of choice. Visual Studio offers some built-in functionality for working with code snippets, but it assumes a couple of things. First, it assumes that you are going to store all of your snippets on your local machine, so if you switch machines or move jobs you have to remember to pack up your snippets and take them with you. Second, these snippets can only be viewed by you. There is no built-in mechanism for sharing snippets between users, groups, or the general public. This is where CodeKeep comes to the rescue. CodeKeep is a Web application that provides a place for people to create and share snippets of code in any language. The true usefulness of CodeKeep is its Visual Studio add-in, which allows you to search quickly through the CodeKeep database, as well as submit your own snippets. After installing CodeKeep, you can search the existing code snippets by selecting Tools | CodeKeep | Search, and then using the search screen shown in Figure 4. From this screen you can view your own snippets or search all of the snippets that have been submitted to CodeKeep. When searching for snippets, you see all of the snippets that other users have submitted and marked as public (you can also mark code as private if you want to hide your bad practices). If you find the snippet you are looking for, you can view its details and then quickly copy it to the clipboard to insert into your code. You can also quickly and easily add your own code snippets to CodeKeep by selecting the code you want to save, right-clicking, and then selecting Send to CodeKeep.This will open a new screen that allows you to wrap some metadata around your snippet, including comments, what language it is written in, and whether it should be private or public for all to see. Whenever you write a piece of code and you can imagine needing to use it in the future, simply take a moment to submit it; this way, you won’t have to worry about managing your snippets or rewriting them in the future. Since CodeKeep stores all of your snippets on the server, they are centralized so you don’t have to worry about moving your code from system to system or job to job. CodeKeep was written by Arcware’s Dave Donaldson and is available from http://www.codekeep.net. API calls within the .NET Framework. One of the hard parts of using P/Invoke is determining the method signature you need to use; this can often be an exercise in trial and error. Sending incorrect data types or values to an unmanaged API can often result in memory leaks or other unexpected results. PInvoke.NET is a wiki that can be used to document the correct P/Invoke signatures to be used when calling unmanaged Win32 APIs. A wiki is a collaborative Web site that anyone can edit, which means there are thousands of signatures, examples, and notes about using P/Invoke. Since the wiki can be edited by anyone, you can contribute as well as make use of the information there. While the wiki and the information stored there are extremely valuable, what makes them most valuable is the PInvoke.NET Visual Studio add-in. Once you have downloaded and installed the PInvoke.NET add-in, you will be able to search for signatures as well as submit new content from inside Visual Studio. Simply right-click on your code file and you will see two new context items: Insert PInvoke Signatures and Contribute PInvoke Signatures and Types. When you choose Insert PInvoke Signatures, you’ll see the dialog box shown in Figure 5. Using this simple dialog box, you can search for the function you want to call. Optionally, you can include the module that this function is a part of. Now, a crucial part of all major applications is the ability to make the computer Beep. So I will search for the Beep function and see what shows up. The results can be seen in Figure 6. .NET. The wiki suggests alternative managed APIs, letting you know that there is a new method System.Console.Beep in the .NET Framework 2.0. There is also a link at the bottom of the dialog box that will take you to the corresponding page on the wiki for the Beep method. In this case, that page includes documentation on the various parameters that can be used with this method as well as some code examples on how to use it. You then simply need to write a call to this method and your computer will be beeping in no time. The PInvoke.NET wiki and Visual Studio add-in take away a lot of the pain and research time sometimes involved when working with the Win32 API from managed code. The wiki can be accessed at http://www.pinvoke.net, and the add-in can be downloaded from the Helpful Tools link found in the bottom-left corner of the site. The Visual Studio IDE includes a huge number of different Windows, all of which are useful at different times. If you are like me, you have different window layouts that you like to use at various points in your dev work. When I am writing HTML, I like to hide the toolbox and the task list window. When I am designing forms, I want to display the toolbox and the task list. When I am writing code, I like to hide all the windows except for the task list. Having to constantly open, close, and move windows based on what I am doing can be both frustrating and time consuming. Visual Studio includes the concept of window layouts. You may have noticed that when you start debugging, the windows will automatically go back to the layout they were in the last time you were debugging. This is because Visual Studio includes a normal and a debugging window layout. Wouldn’t it be nice if there were additional layouts you could use for when you are coding versus designing? Well, that is exactly what VSWindowManager PowerToy does. After installing VSWindowManager PowerToy, you will see some new options in the Window menu as shown in Figure 7. The Save Window Layout As menu provides commands that let you save the current layout of your windows. To start using this power toy, set up your windows the way you like them for design and then navigate to the Windows | Save Window Layout As | My Design Layout command. This will save the current layout. Do the same for your favorite coding layout (selecting My Coding Layout), and then for up to three different custom layouts. VSWindowManager will automatically switch between the design and coding layouts depending on whether you are currently viewing a designer or a code file. You can also use the commands on the Apply Window Layout menu to choose from your currently saved layouts. When you select one of the layouts you have saved, VSWindowManager will automatically hide, show, and rearrange windows so they are in the exact same layout as before. VSWindowManager PowerToy is very simple, but can save you a lot of time and frustration. VSWindowManager is available from vswindowmanager.codeplex.com/. Visual Studio makes creating Web services deceptively easy You simply create an .asmx file, add some code, and you are ready to go. ASP.NET can then create a Web Services Description Language (WSDL) file used to describe behavior and message patterns for your Web service. There are a couple problems with letting ASP.NET generate this file for you. The main issue is that you are no longer in control of the contract you are creating for your Web service. This is where contract-first development comes to the rescue. Contract-first development, also called contract-driven development, is the practice of writing the contract (the WSDL file) for your Web service before you actually write the Web service itself. By writing your own WSDL file, you have complete control over how your Web service will be seen and used, including the interface and data structures that are exposed. Writing a WSDL document is not a lot of fun. It’s kind of like writing a legal contract, but using lots of XML. This is where the WSContractFirst add-in comes into play. WSContractFirst makes it easier to write your WSDL file, and will generate client-side and server-side code for you, based on that WSDL file. You get the best of both worlds: control over your contract and the rapid development you are used to from Visual Studio style services development. The first step to using WSContractFirst is to create your XML schema files. These files will define the message or messages that will be used with your Web services. Visual Studio provides an easy-to-use GUI interface to define your schemasthis is particularly helpful since this is one of the key steps of the Web service development process. Once you have defined your schemas you simply need to right-click on one of them and choose Create WSDL Interface Description. This will launch the Generate WSDL Wizard, the first step of which is shown in Figure 8. Step 1 collects the basics about your service including its name, namespace, and documentation. Step 2 allows you to specify the .xsd files you want to include in your service. The schema you selected to launch this wizard is included by default. Step 3 allows you to specify the operations of your service. You can name the operation as well as specify whether it is a one-way or request/response operation. Step 4 gives you the opportunity to enter the details for the operations and messages. Step 5 allows you to specify whether a element should be created and whether or not to launch the code generation dialog automatically when this wizard is done. Step 6 lets you specify alternative .xsd paths. Once the wizard is complete, your new WSDL file is added to your project. Now that you have your WSDL file there are a couple more things WSContractFirst, can do for you. To launch the code generation portion of WSContractFirst, you simply need to right-click on your WSDL file and select Generate Web Service Code. This will launch the code generation dialog box shown in Figure 9. You can choose to generate a client-side proxy or a service-side stub, as well as configure some other options about the code and what features it should include. Using these code generation features helps speed up development tremendously. If you are developing Web services using Visual Studio you should definitely look into WSContractFirst and contract-first development. WSContractFirst was written by Thinktecture’s Christian Weyer. Your mouse probably has five buttons, so why are you only using three of them? The VSMouseBindings power toy provides an easy to use interface that lets you assign each of your mouse buttons to a Visual Studio command. VSMouseBindings makes extensive use of the command pattern. You can bind mouse buttoms to various commands, such as open a new file, copy the selected text to the clipboard, or just about anything else you can do in Visual Studio. After installing VSMouseBindings you will see a new section in the Options dialog box called VsMouseBindings. The interface can be seen in Figure 10. As you can see, you can select a command for each of the main buttons. You probably shouldn’t mess around with the left and right mouse buttons, though, as their normal functionality is pretty useful. The back and forward buttons, however, are begging to be assigned to different commands. If you enjoy having functionality similar to a browser’s back and forward buttons, then you can set the buttons to the Navigate.Backward and Navigate.Forward commands inVisual Studio. The Use this mouse shortcut in menu lets you set the scope of your settings. This means you can configure different settings when you are in the HTML designer as opposed to when you are working in the source editor. VSMouseBindings is available from archive.msdn.microsoft.com/VSMouseBindings. Code is exponentially more readable when certain parts of that code are differentiated from the rest by using a different color text. Reading code in Visual Studio is generally much easier than trying to read code in an editor like Notepad. Chances are you may have your own blog by now, or at least have spent some time reading them. Normally, when you try to post a cool code snippet to your blog it ends up being plain old text, which isn’t the easiest thing to read. This is where the CopySourceAsHTML add-in comes in to play. This add-in allows you to copy code as HTML, meaning you can easily post it to your blog or Web site and retain the coloring applied through Visual Studio. After installing the CopySourceAsHTML add-in, simply select the code you want to copy and then select the Copy Source as HTML command from the right-click menu. After selecting this option you will see the dialog box shown in Figure 11. After you select Copy As HTML and configure the HTML to include line numbers, this code will look like Figure 12 in the browser. Anything that makes it easier to share and understand code benefits all of us as it means more people will go to the trouble of sharing knowledge and learning from each other. CopySourceAsHTML was written by Colin Coller and can be downloaded from copysourceashtml.codeplex.com/. Visual Studio 2005 includes a new debugging feature called visualizers, which can be used to create a human-readable view of data for use during the debugging process. Visual Studio 2005 includes a number of debugger visualizers by default, most notably the DataSet visualizer, which provides a tabular interface to view and edit the data inside a DataSet. While the default visualizers are very valuable, perhaps the best part of this new interface is that it is completely extensible. With just a little bit of work you can write your own visualizers to make debugging that much easier. While a lot of users will write visualizers for their own custom complex types, some developers are already posting visualizers for parts of the Framework. I am going to look at one of the community-built visualizers that is already available and how it can be used to make debugging much easier. The ASP.NET Cache represents a collection of objects that are being stored for later use. Each object has some settings wrapped around it, such as how long it will be cached for or any cache dependencies. There is no easy way while debugging to get an idea of what is in the cache, how long it will be there, or what it is watching. Brett Johnson saw that gap and wrote Cache Visualizer to examine the ASP.NET cache. Once you have downloaded and installed the visualizer you will see a new icon appear next to the cache object in your debug windows, as shown in Figure 13. When you click on the magnifying glass to use the Cache Visualizer a dialog box appears that includes information about all of the objects currently stored in the ASP. NET cache, as you can see in Figure 14. Under Public Cache Entries, you can see the entries that I have added to the cache. The entries under Private Cache Entries are ones added by ASP.NET. Note that you can see the expiration information as well as the file dependency for the cache entry. The Cache Visualizer is a great tool when you are working with ASP.NET. It is also representative of some of the great community-developed visualizers we will see in the future. While this article has been dedicated to freely available add-ins, there are also a host of add-ins that can be purchased for a reasonable price. I encourage you to check out these other options, as in some cases they can add some tremendous functionality to the IDE. This article has been a quick tour of some of the best freely available add-ins for Visual Studio. Each of these add-ins may only do a small thing, but together they help to increase your productivity and enable you to write better code.